Fire Emblem Heroes is Nintendo’s new strategy-RPG game now for mobile (and PC via BlueStacks!) Collect and build heroes as you are the summoner to put their skills to battle in turn-based combat. Fight in arena duels against other players around the globe. In this Fire Emblem Heroes game guide for PC you will learn of strategies implored by one of our avid gamers in our Community whose screen name is soulcollecter1. 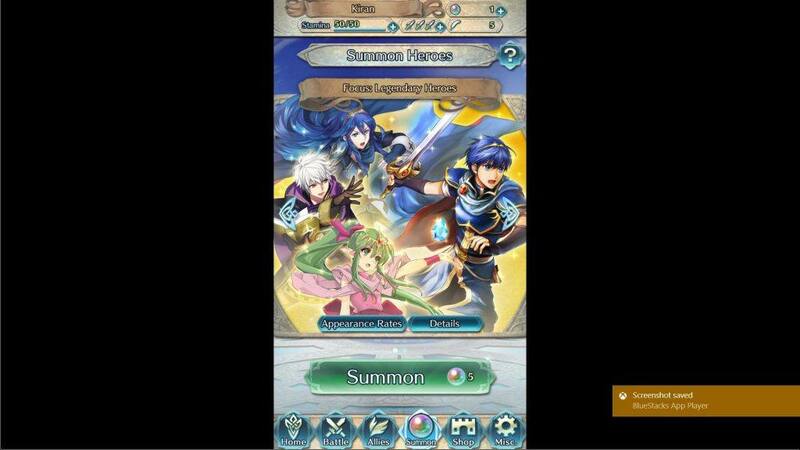 Lets jump right in and take a look at Nintendo’s first mobile game Fire Emblem Heroes. I’m currently on Chapter 6 with a team of four, which are 4-star level 20 heroes. In my opinion, Fire Emblem Heroes is a great RPG with grid based movement. It’s easy to pick up and play… then grind away! If there are any gripes about the game, I would advise you create a Nintendo account and link it. The issue I experienced was a game crash in BlueStacks when first trying to clear some special maps. This was not rectifiable with a simple reboot- thus I had to delve into BlueStacks settings to clear data which then lead to me re-downloading 400MB of data and repeating the initial sign-in process all over again. 🙁 I would also suggest Nintendo allow more Arena bout time as it seems to be open only at certain times. For instance, I have a really nice all 4-star team and it’s a shame I have not been able to use them in battles against others… just yet. The protagonist Kiran, a legendary hero, was summoned by Breidablik which you will use to summon more heroes as the story unfolds. Your mission should you accept it… take on evil Emblian Empire that invades Hero worlds and attempts to take them over. This is a turn-based RPG with grid-like movement. As mentioned I would advise the first thing to do is create a Nintendo account and link it if you do not already have one. This allows you to earn extra rewards. Thereafter, the tutorial will show you how-to movement and the basics. In this game there’s no special need for keymapping as the game involves simple click, point and drag movements of the mouse. You will want to clear the Story mode past chapter one to build up orb count as well as unlock everything. Also make sure to clear missions and quests. Then head over to the Summon area with 20 plus orbs. You will have a better chance at rares and lower costs if you summon up to five times. For example, one time I got super lucky receiving four 4-star max grade hero and one 3-star hero. Next I invested orbs into leveling up heroes as well as 100% experience boost for a Royal Castle. Then I proceeded to clear chapters picking up mission and quest goals along way. After progressing to higher levels, victories become tougher. I personally decided to move to the Training Tower and worked to upgrade each character to level 20. It is good to have a nice balance of heroes of each class. The best battle tips I would advise are to try to upgrade heroes to level 20, make use of their SP and invest as much as you can into their best skills. Try to upgrade low star heroes such as three star heroes by getting rid of weaker ones such as one and two star combatants. The battlefield features a grid pattern with turn-based limited movement. Tip: turn on “Auto Battle” to help assist you in gaming. To achieve victory try to keep an even balance of team members including; attackers, healers and summon casters for high damage. I personally try to surround enemies and box them in. I make sure keep my team sticks close together. This allows for special allied attacks or moves can be executed by dragging one onto another. In summary, keeping farming the game by upgrading hero levels & skills, collecting orbs & shards, completing missions & quests. Here’s a link to my Facebook page with more videos and photos playing Fire Emblem Heroes. This is my strategy and I hope you find it helpful. Please comment below if you have any questions or concerns.